As with all glacial processes, the processes of ice advance and retreat operate at a variety of scales: that associated with the general growth of an ice sheet over thousands of years and thousands of kilometres, or shunts of the ice margin of a few centimetres on a single day. The measurement of past regional-scale ice advances is achieved by mapping 'first order' glacial geological features (e.g. drumlins and ribbed moraines), which identify concentric zones of advancement of the ice sheet, so the flow becomes the dominant imprint on the landscape over time (Hughes, 1998). These features are important as they inform us of major climatic shifts. 'Second order' glacial geology consists of lineations, forms and sediments that arise near ice margins and weakly overprint first-order glacial geology; these are measured by mapping local-scale features such as flutes, tectonic structures and till units. Second-order glacial geology is being constantly overprinted as the ice sheet advances and retreats at this local scale. Within this system, most moraines are formed because sediment is constantly being delivered to the ice margin; where the margin pauses a positive moraine feature is created. Therefore, most moraines are built at still-stands during overall retreat, and not by ice 'bulldozing' sediment into a ridge. It is therefore erroneous to equate moraines as indicative of first order ice (re)advance. Figure 51.1 Non-azimuth bias shaded DEM of the area around the type-site for the Drumlin Readvance Moraine of Ireland, around Kells in County Meath. The image covers 45 km by 20 km. The lines show the various positions of the moraine according to different authors through the years; eight different positions in all. Note the presence of intact and buried streamlined features south of all moraine lines, and the absence of any definite end-moraine feature. appeared (e.g. Synge & Stephens, 1960; McCabe, 1985; Warren, 1991; Bennett & Boulton, 1993). It is important to note that most of these supporting data occur at the second-order scale described above. With the Irish DR, a broad band of hummocky topography in the north-centre of the country was interpreted as a composite landform assemblage 'probably' forming an end-moraine associated with accelerated ice flow, drumlinization and margin read-vance (Charlesworth, 1928). There is no glaciological basis for this and indeed most drumlin patterns (e.g. those covering most of Canada; see Boulton & Clark, 1990b) do not conform to this association, and in fact mostly relate to the retreat phase of the ice sheet. 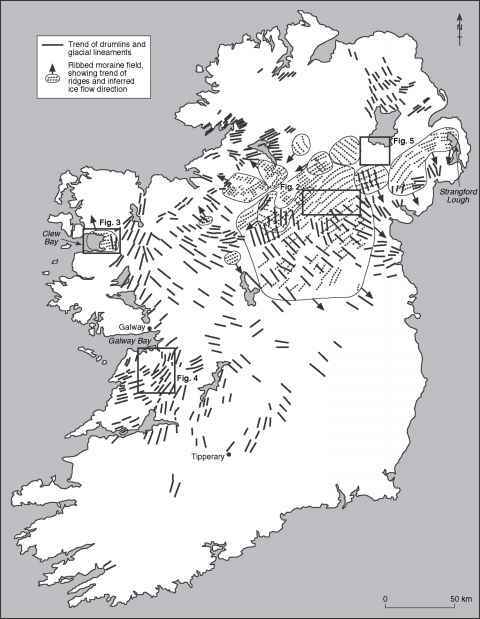 Up until the 1990s there had been no mapping of sediments and/or landforms anywhere inland along the feature, notably around the 'type-site' at Kells, County Meath. Morphological and sediment mapping was therefore carried out here over an area of 900km2 (Meehan, 1998). The mapped results of this, which were at the second-order scale of geological mapping (1:50,000), were then cross-checked with DEM analysis of the first-order, regional indicators of ice flow. The resultant pattern shows that the moraine feature seemed to be a misnomer as drumlins, crag-and-tails and ribbed moraines associated with the same first-order ice advance occur south of all previously drawn 'moraine' lines (Fig. 51.1). Furthermore, following subsequent work (Clark & Meehan, 2001) it was observed that the end of the features' associated flow is at least 30km (and possibly more) further south. On the second-order level, results showed that the huge expanse of hummocky terrain, which has been simplified as a single, linear feature, has a more complex process history. Within this area, portions of hummocks comprise areas of bedrock, tectonite, fan and delta sands and gravels, pitted sandur, minor ribbed moraines and even buried drumlins, all of which had distinctly different formational processes and settings (e.g. Meehan, 1998; Clark & Meehan, 2001). 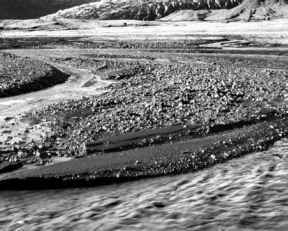 The sediment-form geometry suggests a sustained, coherent retreat of ice with the development of a number of broad outwash systems in valleys between moulded crag-and-tail ridges, drumlins and subtle streamlinings. Furthermore, around the areas of the moraine 'feature', nowhere was evidence of a readvance (a 'capping' till) found, even in 49 specially dug trenches and 39 specially drilled boreholes. It seems that earlier literature overlooked the fact that even in a retreating ice sheet, the ice flow is still directed forwards and is capable of producing streamlined landforms. The early idea of equating drumlins with first-order (re)advances has propagated through the literature, but with no basis, and strong contradictions from elsewhere. In conclusion, none of these morphologically based arguments is valid, and yet they still have influence. The only morphological evidence capable of demonstrating a readvance is an ice marginal feature that has been overridden, leaving a signature of drumlins or flutes on top of it. Stratigraphically, evidence of subglacial sediment (till) or ice-marginal features (moraines) superimposed stratigraphically above proglacial sediments (outwash, lake sediments, organic deposits, soil horizons) is needed. These are both at the second-order scale. As scientific writing has developed over the decades since the 1920s the distinction between description and interpretation has become an overriding tenet. The DR moraine's history proves this was not so in the past. Supposed readvances in Britain, Ireland and elsewhere may require re-examination using the methods outlined above in light of these results.